A year of wildlife sound recordings from the British Library Sound Archive, selected by Heather & Ivan Morison. 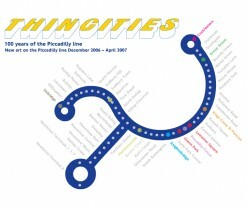 In Zoorama the artists present the sounds of fifty-two migratory animals – one to represent each of the fifty-two stations along the Piccadilly Line and one for each week of 2007. The original audio material has been sourced with permission from the British Library Sound Archive. Each recording is unique and some are especially rare.